Since I've started to give love to my old stuff I couldn't leave my hands of my second hellhound. I bought two with the intention to buy three in the future (everything for some specialrules in apoc). 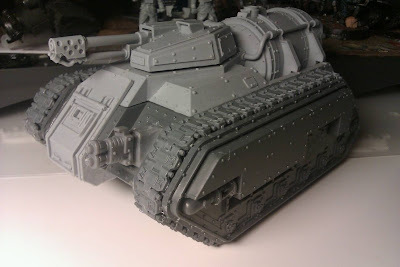 But this one is build on the old Chimera chassi which has the fat sidearmour that I dislike. So my first project was to make it a bit slimmer. If it doesn't show on the pic it's almost half the size (the armour is half the size, not the tank). Next up to adjust was the small side hatches. They didn't have the classic eagle. Don't ask me why. Instead the GW sculptures had made a skull with wings. The skull is no moor! I will instead use an imperial eagle made in edge brass from Forge World. Nice. Love that model. The skull and wings are the imperial guard symbol. I know that you think I'm completely stupid, as a matter of fact I'm just I bit dumb. The reason I don't want the skull with wings (which is the Imperial Guards sign for those how didn't know) is that I'm so sick of all skulls and felt that a classic eagle would look better. When reread my post again I can now see why you pointed out the sign. My heart is now filled with joy! Like Clause the Xmas dude would had said, hohoho!